Today I will show you how I made this easy fancy strawberry shortcake. I am not going to give you a recipe just assembly instructions. I used a white cake mix for the shortcake and prepared as directed on box. I took equal parts whipped cream and vanilla icing whipped together and spooned that into the center of the cake. I have placed whole cherries and then sliced up strawberries on top of that. I then took a ready-made strawberry pie glaze and drizzled that on top of the fruit. Then I garnished with mint leaves and strawberry blossoms. Here is the cake pan I used to make my cake. It is a Nordic Ware pan, the Marianne pan. I found mine at a consignment store. 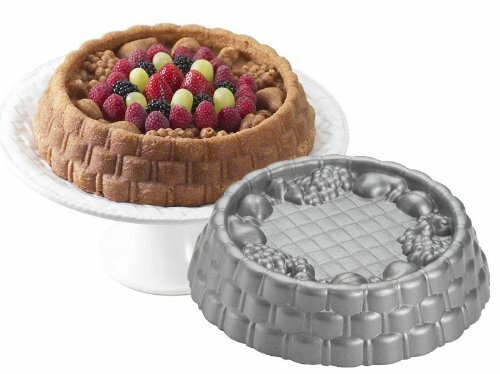 It has that nice basket weave pattern on the sides that works perfectly with shortcake. Strawberry season is one of my favorite times of the year to bake. I love using the fruit to garnish and style food. Do you like strawberry season like me? This does seem pretty easy! I confess sometimes I'm too lazy to make the shortcake and just eat strawberries and whipped cream! Gorgeous Sherry! I have that pan and now I'm craving a beautiful strawberry shortcake! Sherry, this is almost too pretty to eat! Beautiful cake! I love strawberry shortcake, but have never used a special pan. The way you arranged the berries with the little flowers and mint leaves makes this look like a boquet. YUM!!!! I love strawberry shoetcake and this one looks delicious!!! Thanks for sharing this!